In business since 2000, serving the local areas with a combined industry experience of fifty years. Contact your Custom Tints customer service reps for a quote! Serving you from our local shop home base located in the city of Wentzville, MO with another new shop location in the nearby area coming soon. Our convenient location lets us work closely with customers from our neighboring counties. 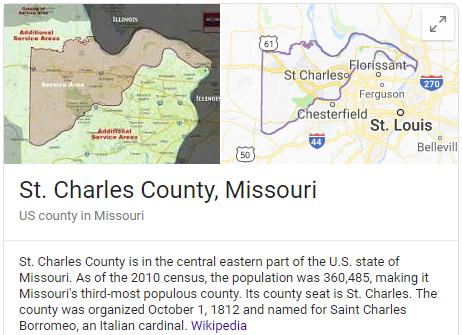 St. Charles County has, give or take 400,000 people living in it. A beautiful place on the map to be in whether you live here or visit, really anytime of the season… well depending on what kind of weather you like, as there is plenty of climate changes to enjoy in the local area. The fact that St. Charles County is really close to St. Louis, you can always head into the city or find many things to do our in the country areas… among many other things there is wine tasting at some of the local vineyards, awesome parks and playgrounds for the kids plus good food to eat at plenty of restaurants around. Doesn't matter what you do or where you go within the St. Charles County I would highly recommend you drive there with tinted windows in your vehicle. Most people don’t know all the window tinting benefits you get when you tint your windows… and that includes the windows in your car, truck, home, office, boat, tractor or aircraft. The most common reason people think of for tinting your windows is the looks, as different shades of tint can really change to look and feel of your ride or home, business and so on. There are health benefits that the Skin Cancer Foundation endorse window tinting films that help protect and prevent skin cancer from the sun's harmful UV rays, both the UV A and UV B that radiate out from the sun. As far as safety goes when tinting your windows, you have out of sights out of mind when you go with one of the darker privacy films. But then also with any shade of film the tint will help hold the window together if and when, God forbid you ever get into an accident. Now in my experience and personal opinion, the biggest and best benefit to getting your windows tinted is blocking out the heat from the hot sun on them sunny days. There are many different types of film, many different qualities and lines of film within each brand of film out there in the market… Normally the most expensive films on the market cut out the most heat too. Well, there are a few more benefits of window tinting, that you can find online, or on our website or feel free to call or come into the shop and ask are experts more about window tinting and your options. We are happy to help. With that said I also wanted to bring up a few other products and services we offer that you may be interested in or know someone that is. Services like, PPF or otherwise known as Paint Protection Film… this is a clear protective film that goes on your vehicles paint to help prevent rock chips in your paint. It’s not a cheap service but well worth it on the newer vehicles that don’t want to get expensive paint jobs in the future. We also do full color change Vehicle Wraps and Spot Graphics for your company fleets or your personal every day driver. If your interested in any of our services please contact us today! Zip Codes include: 63332, 63341, 63348, 63367, 63368, 63366, 63373, 63304, 63301,63303, 63376, 63385 and 63386.